Since the start of my adventure into the “cooking” world, I’ve been slightly scared to make Broccoli soup. Crazy right? I guess I have too many scary memories of all of those “Cream of” canned soups growing up. And for years, I wished that I could duplicate the broccoli and cheese soup I remember eating back home at my favorite deli Murray’s. Their soup was incredibly flavorful as a side to their Turk-ado sandwich which was a triple decker with turkey, avocado, bacon, and sprouts. Yummmm So I figured it was time to finally stop being afraid of what could go wrong and think of what could go right. I’m glad I did! 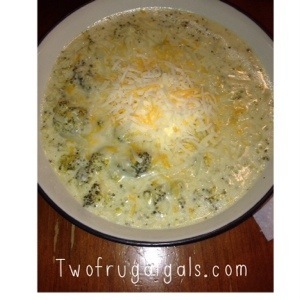 This soup was also a great way to get the kiddos to eat their vegetables they don’t ordinarily like. Mission accomplished! 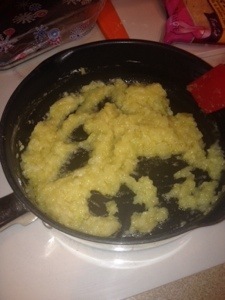 Melt butter in a pot over medium heat, then add the onions. Cook the onions for 3 to 4 minutes, then sprinkle the flour over the top. Stir to combine and cook for 1 minute. 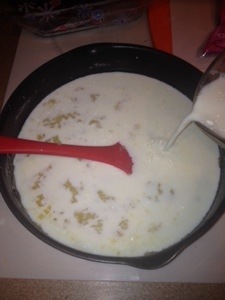 Then pour in milk and half-and-half. Add nutmeg, then add broccoli, a small dash of salt, and plenty of black pepper. Cover and reduce heat to low. Simmer for 20 to 30 minutes, or until the broccoli is tender. Stir in cheese and allow to melt. Taste seasonings and adjust if needed. Then either serve as is, or mash it with a potato masher to break up the broccoli a bit, or transfer to a blender in two batches and puree completely. (If you puree it in a blender, return it to the heat and allow to heat up. Splash in chicken broth if needed for thinning.) Enjoy!